With 10,000 people at Web 2.0 Expo, a curtain was pulled back to reveal the room adjoining the echo chamber. With more people than Techcrunch subscribers, you had to ask, "who are these people?" Oh, right, our markets and communities. People of the web, perhaps with more zeal or entrepreneurial interest than people who "get their news from the web." The diversity was really refreshing although after helping out on both the Socialtext and SuiteTwo booths, it was exhausting. My keynote panel seemed to go well, here's a five minute video clip. We announced that VisiblePath is joining SuiteTwo to go beyond wikis, blogs and RSS into Social Networking for the Enterprise. In a breakout panel we had a chance to explore it further, but the interesting part was the participation from Cisco and P&G, two leading companies that are pragmatically adopting best-of-breed social software. Both of them agreed with the need for further standards in this area, such as Amo. Thanks mostly to the effort of Tara Hunt and Chris Messina, Web2Open was a success. My favorite session was learning about KnowledgeAsPower, something that wouldn't have made its way to the big stage, trying to apply Web 2.0 to a real problem in politics. How elected representatives interface with their constituency. Sarah Schacht noticed a significant disconnect from the policies made just miles away between New Hampshire and Vermont. Vermont has a greater number of representatives to citizens and potentially as a result was able to develop some better health care legislation in touch with citizen needs. In the pre-progressive era (1890s) we had the highest voting rates in US history, between 90-94% of eligible voters did. Largely because elected officials were closer to their constituents. Town halls were actually held in town halls, or even barber shops. The Civil Rights movement was borne of this era. Today the population relative to elected officials has grown, and technology has become more of a problem than a solution. The media has decreased their role in helping communicate on state issues to constituents. The best help for a citizen who wants to engage on a given issue is the website of a legislative body, but they are just official factual messages that have a 48 hour lag from staffers to website. So they created a site for the State of Washington that lets a citizen subscribe to a specific issue or bill they are interested in and participate by sending Legislators email. But the other problem is your average politician is consumed with email. They use Outlook, and only have 1.5 staffers to help manage 800-1,300 demails per day. With 90-120 day legislative sessions and lobbyists consuming time -- their outbound communication is limited to once or twice per session -- via newsletters, mass emails and town hall meetings. She demoed their potential solution for the first time. Citizens send email through a slightly structured web interface. The legislator gets a dashboard for their email, with a row for each bill, enabling them to scan relative interest in different issues, number of emails pro/con and the ability to respond directly to different emergent groups. I shared Politicopia with the session, which could be a great complement to their effort. Sometimes we get caught up in the hype of cool social tools and forget that what we are doing is providing alternatives to email for social interaction, armed with backlinks, pings and feeds. And the real value is when you can apply them to solving a specific problem. While my personal interests tend to draw me to such projects, if it wasn't for Web 2.0 Expo trying a hybrid open source business model with Web2Open, I wouldn't have found it or a way to contribute. One person told me that a session by a guy who runs a comic book store was the best he saw in the event overall. Wouldn't it be interesting if it became a feeder for the big stage. People felt left out of Web 2.0 in past events because of the cost of attending such a high-powered professionally produced program. Similar to how some people felt left out from FooCamp by not being invited, but channeled their energies positively to create Barcamp with an open door principle. Last year I had a conversation with Jen Pahlka about having a Barcamp-style event in parallel to Web 2.0, calling it Web2Open. Chris Messina and Tara Hunt were similarly lobbying. With Jen's effort, the good graces of Tim O'Reilly and John Battelle, some help from Brady Forrest -- it's all happening. Throughout Web2Open, the Mashroom will be open for people to bring their APIs and do something together. 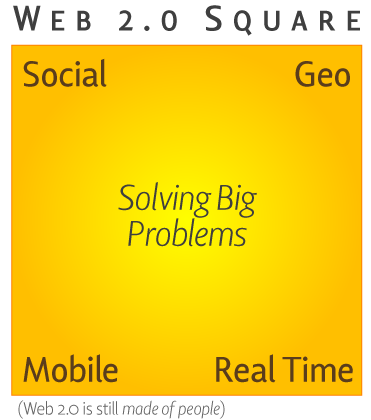 Web 2.0 Expo is going to be quite an event itself, of course. We're talking Moscone scale now. I'm on a keynote panel about Enterprise 2.0 alongside Satish Dharmaraj, Dan Farber and Subrah Iyar. Later Wednesday afternoon holding a workshop with Rob Rueckert, Michael Lenz, David Meyer, Joe Schueller. There are also a couple of parties. John Markoff writes in the NY Times that Web 3.0 is coming. Apparently he missed my post last week, for There is no Web 3.0. The funny thing about my summation last year (Web 2.0 is Made of People!) is the web has always been that way -- and always will. At first glance, John seems to think the next web is made of machines. From the billions of documents that form the World Wide Web and the links that weave them together, computer scientists and a growing collection of start-up companies are finding new ways to mine human intelligence. I'd bet the future is less the Matrix than Soylent Green. Less semantic fuzz than social discovery. Less artificial intelligence than human intelligence. Less automation and more augmentation. Wandering around the Web 2.0 Summit I saw more presentations using 3.0 than I can enunummerate. Some were about more immersive platforms, some desire the singularity, but most just wanted to be new and cool. Besides, Web 2.0 will be known as the name of a bubble. And 3.0 would only be a marketing disaster. Here is to the lobbyists. Those that pressed the flesh in the corridors of power that was the Web 2.0 summit. Not taking no for an answer, the tireless souls that for three days made the public spaces of the Palace Hotel their home. In the mold of a K-street pro, but selling themselves. It was not the stench of power, but the smell of money that moved them. Some cracked the DRM, others bought silver sponsorships just for two included tickets -- but it was the lobbysts who showed up for the hallway conversations. See you at the Enterprise 2.0 Workshop at 8:30am. If Web 2.0, whatever it is, becomes a worthwhile investment for businesses, two things must occur. Few tools clear both hurdles in significant ways. Peter and Jesse from Adapative Path say technology has predominantly been carrying the torch, so far, to Web 2.0, and what's been missing is the discipline of design -- simplicity in experience. They're right. Purely simple user experience (with high efficacy) will decide uptake. Simplicity will drive first use, and use #2-5. Pete Kaminski sees the other signficant defining signature of Web 2.0 -- groups of people finding each other to get things done they care about. When people have simple, useful ways to connect, they do. The social infrastructure will drive continued use. Full disclosure, Omidyar Network is an investor in Socialtext. ON invested in FM Publishing too. Could have gotten a higher valuation if it got Pierre out of speaking. From the beginning at eBay I knew that once it had begun becoming a business, if I was lucky I could build it to a certain point and then hand it over to someone for the next level. An issue of bringing in new blood to build something new with the same values. Not needing to be involved in every decision, Interested in how we coudl take the learnings at eBay and apply them to other sectors. Started a foundation. Trying to make the world a better place in the traditional way. Started thinking that if you want to have an impact in the real world, why do you have to in this sector? When you look at eBay, after 10 years, 150 million customers have learned they can trust a complete stranger. That a business can have this very social impact of a slightly higher level of trust was intriguing. Reorganized as ON, expanded into for profit ways. JBat: Now in the VC Biz? A little different, it's a mission based fund. We are about fostering individual self-empowerment. The fund is $400M, all my money, going to do something good with this, investing over 5 years. JBat: I'm not good with math. Oops, shouldn't say that in front of our funder. Looking for businesses that can only be successful if they have a positive social good. We are building tools with new technology to bring people together. Adam Smith: given the right environment with people pursuing their self interest leads to an increase in the general welfare. In fact, look at the profit generated in an economic system, if the environment is right, then the existence of profit is evidence of general welfare. If the baker can sell bread to a shoemaker, he can feed his family, and also apply the profit to buy shoes. It's more complex than that, but the principle holds true. We look for three things: does it have a level playing field? does it foster interaction, connecting and communication around shared interests? do the participants have a sense of ownership for what is going on? Then we look at the business model. Is there a revenue model that can only be successful if it maintains the three values and enables the social impact. For instance with a business about trade, and you need people to trust one another, the model predicated if the trade going through. We are pretty rigorous (I can testify to that) in due diligence. Tighter screen because of the mission fit, which also limits the number of opportunities. We are doing this for a social impact on the world. Need to examine the business model that has the social impact. In the social sector there has been a lot of work on trying to measure the social return. Some things easy to measure (how many people did you feed), but the game changing things you can't measure. Going back to Adam Smith, with the right environment (criteria for investment), then evidence of profit is fulfilling the mission. There are so many creative people innovating when the barrier is lower. Fundamentally a good thing, but more competitors, but that's a good thing. Because of our challenge of looking for this tight fit, it is a challenge to invest as much as we want. If you are a company like Google or others building infrastructure for the future, you have to be careful. Want to foster innovation, such as with eBay we have an API program with 20k developers, 45% of listings come from that API program. Trying to foster innovation outside the company's walls. No matter how great we are internally, we need to give people tools so we can foster more innovation. Would invest in eBay now. People connecting around shared interests, the commonality, is a result that you couldn't have done 10 years ago. We look at management team and other more traditional and critical criteria. I personally have less concern about investing in the one winner in a category, or having bets in the same space. Can understand if an entrepreneur has a problem with that. There has to be competition for the pursuit of self interest to work. No externalities that are not priced into the product that you are selling. Market failures. Commercial sector has the ability make the world a better place, but governmental regulation is responsible for fostering the right environment. As an investor, we want government to help understand it's responsibility, while being a good citizen in the private sector and not distort markets. An organization that only focuses on their social good has difficulty scaling compared to those that focus on profits. With both, you get great people and you set them loose. That's what we did at eBay. With the full confidence that as they were pursuing returns they are making the world a better place. On disasters, we haven't looked at preparedness in a very direct way. Have concern about general preparedness. The pandemic will present some very unique challenges. JBat: FM Publishing is aggregating high quality blogs and hopefully make it pay. Web 2.0 is about putting the tools in peoples hands, making them widely available, letting them work together share and collaborate. Start with the belief that people are good, connecting them together is inherently good also, and it will change the world. A monk in the 14th century invented accounting and we've been dealing with it's complexity since. That's what Quicken does. Shows a series of charts and examples where a focus on simplicity has gained them market leadership. When building a TurboTax, at first they used the language of the IRS instead of using what people use, redesigned and it gained them a huge increase in user satisfaction. Quickbooks used by 34 of the Fortune 100, including NCR, Sprint, and the Girl Scouts. Initially to automate the work processes in small customers. A global 500 division with $1.2 billion in procurement. ERP solution almost ready since 1996, nightmare of email and spreadsheet. One guy in one weekend, tailored to fit, no training, ASP. Now there are 600 people who have visibility into the process with instant audit-ability. Talks about Facebook-like profiles inside companies to find each other based on their specialties. Their Newest thing -- Quicken Medical Expense Manager. Dan Robinson had a child with congenital defects and had to deal with real complexity, spent $1M in the first year. Had to deal with the medical billing problem. Has pre-canned dispute letters for when someone is ripping you off. In line with Intuit's mission: Change live so profoundly that people can't imagine going back to the old way.